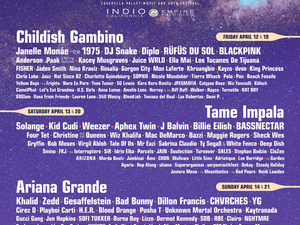 Coachella 2019 lineup includes headliners Childish Gambino, Tame Impala, and Ariana Grande. Other top billed acts include Janelle Monae, Solange, The 1975, Aphex Twin, and J Balvin. The annual music festival will take place over two weekends: April 12–14 and April 19–21.